Father’s Day is just over a week away on Sunday 21 June, and it’s one of our busiest times of the year – you all seem to like buying drinks as presents for your dads. As usual, we’ve got a whole range of special offers, great gifts and tasty spirits that fit the bill, so we thought we’d do a round-up to take the difficulty out of the present-buying process. Our first suggestion is a personalised bottle. With our shiny laser-engraving machine, we can engrave even more bottles than ever before, from Jack Daniel’s Gentleman Jack to Don Julio Tequila and Dom Pérignon to Johnnie Walker Blue Label – we have 35 different bottles to choose from, suiting every budget. We have a variety of fonts to choose from and you can preview how it will look as you type in your message, so you can be sure it will be exactly how you want. Due to the number of people ordering engraved bottles, it does take an extra day or so, so we can’t do next-day deliveries, but if you order now you’ll easily have your bottle in time for Father’s Day. Next up is a giveaway with whiskies from Diageo’s Classic Malts range, as well as a few of their other drams. Buy any bottle in the selection on this page and we’ll send you a tasting glass and a Classic Malts shot glass. 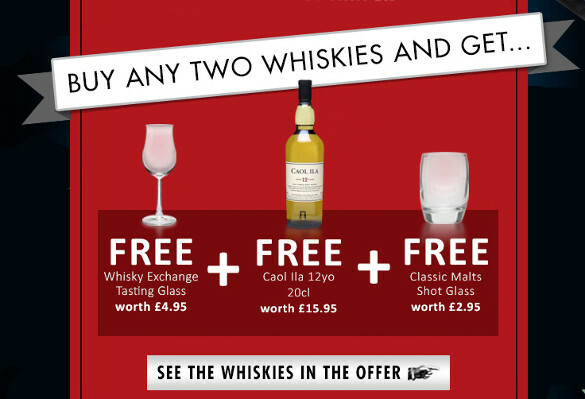 Buy two bottles and we’ll send you the glasses and a 20cl bottle of Caol Ila 12 Year Old worth £15.95. Whether you want to add some glasses to your Father’s Day gift or feel like getting something for yourself at the same time, it’s a good deal. If you’re looking for a bargain, make sure to check out our special offers page – we currently have 148 bottles with savings and free gifts, everything from Champagne to single-cask whiskies. If you’re looking for something particularly special, we have some very good offers on a range of premium whiskies – £10 off Rest and be Thankful Octomore, £24 off Mortlach 18 Year Old, £50 off Glenturret 1977, and much more. And if you’re not sure what to get, then we have loads of suggestions. Not only do we have gift selections in different price ranges, but we also have our Gift Finder, updated with loads of great Father’s Day ideas. There’s still time to make international shipping to most destinations – you can find the full list of times on our delivery information page – and you can be sure of receiving your order in the UK if you order before Wednesday 17 June. If you’re running a little late, then we do offer next-day, Saturday and Sunday deliveries in the UK, so we’ll still be able to get your gifts to you by Father’s Day as long as you order before 2pm on Friday 19 June and choose the right delivery option at checkout. Whatever you choose, we hope you and all the dads out there have a great day.